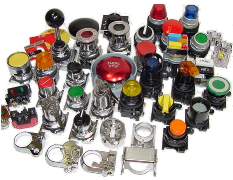 Eaton's 10250T line of 30.5 mm pushbuttons features a heavy-duty zinc die cast construction. Reliability nibs improve contact reliability even under dry circuit and fine dust conditions. In addition, drainage holes prevent the buildup of liquid inside the operator, which can prevent operation in freezing environments. Eaton's E34 line of pushbuttons offers the same rugged die cast construction of the 10250T line with an additional two-layer, 100 percent solid thermosetting cathodic epoxy coating. Are the 10250T operators CE rated? What is the maximum number of contact blocks that can be mounted on a 10250T operator?